We’re back in the world of the Fey with Julie Kagawa, this time following Ethan as he investigates the mysterious disappearance of his friend at the hands of faeries. 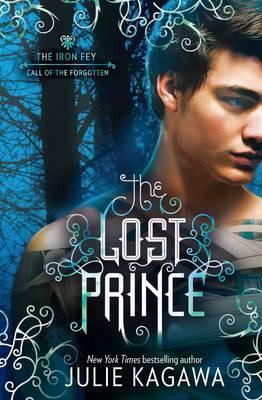 The Lost Prince introduces a lot of new characters but keeps us in touch with our old favourites from The Iron Fey series, and I enjoyed it a lot more than the original books. I didn’t get along with Meghan in the first series, if you recall, and I was afraid that I wouldn’t like Ethan very much either. But whereas I never really understood why Meghan felt so abandoned and woe-begotten, I understood Ethan’s feelings of otherness and sympathised with him a lot more. I also liked Kenzie, his school friend who gets sucked up into the madness that is Ethan’s life, a lot more than I had initially liked Prince Ash (the blasphemy!). In fact, I didn’t very much like Meghan and Ash in this book either: they only make small appearances but I think the way they handled themselves was positively abhorrent. Ethan, although silly and inept at making good decisions, is a lot more likeable than his sister and I think Kenzie handled the strange events in her life admirably. Since readers are presumably quite familiar with Nevernever, I found the balance between showing us Ethan’s reactions to the Iron Court and not overloading readers with information they already knew to be very good. It’s also really cool to see how many changes Meghan has brought about in the Iron Kingdom during her time as the Iron Queen: there’s a lot that’s familiar from our world, but changed to be more magical and reminiscent of the Fey. Julie Kagawa handled a lot of the world-building aspects well and I think the expansion into Ireland, New York and Maryland to be interesting (Sheep!). One of the most gratifying aspects of the book have to be the relationships forged between the new trio. Love triangles are getting OLD, and I am glad that Julie didn’t go down this path with Ethan, Kenzie and Kierran. Ethan and Kenzie both have secrets and have to work through a lot of personal issues before they can be honest to one another, and themselves, about their growing feelings. Similarly, it was cool to see them slowly begin to like and trust Kierran, especially Ethan because he’s inclined to instantly hate anything Fey. Having read Iron’s Prophesy, I’m curious to see how the story will develop between the three of them. The Lost Prince is a good start to what will no doubt be an interesting series. It’s a good read that is, in many ways, a lot smoother than The Iron King was. A must read for fans of The Iron Fey, I would suggest to new readers that they read the original series first because this book contains major spoilers for it. I’ll be looking forward to the sequel, The Traitor Son, with excitement. I just finished reading The Iron King, and I have to say I was a little underwhelmed. I liked it, but I found Meg a bit disagreeable, and I don’t completely see what her relationship with Ash is even based on. And I can see the future love triangle coming. But I’m glad to see you think Kagawa’s storytelling improves, which makes me more optimistic about finishing The Iron Fey series.